Dealing with picky eaters is a topic close to my own heart, as two of my kids are fussy eaters. I have to confess it has been a real challenge for us as a family. 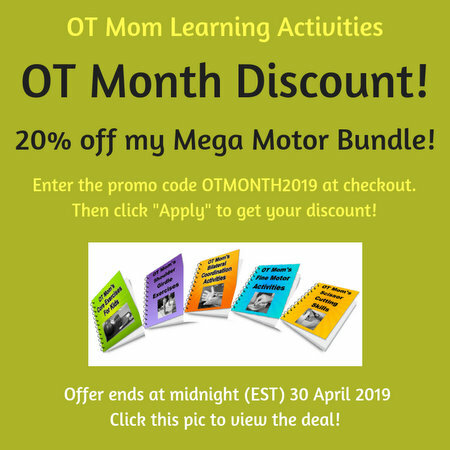 Here, I offer some insight from my background in occupational therapy, as well as some strategies that worked for me as a parent! Why Is My Kid A Picky Eater? You can read lots of parenting articles and get a range of answers ranging from "typical toddler behavior" to "control issues". But from an occupational therapy perspective, things can look a bit different. Many kids are fussy eaters because they are struggling with sensory processing issues. a child who is over-sensitive to sensations in the mouth (also called oral defensiveness), may gag on solid food and avoid strongly flavored food. Food which is lumpy can also cause gagging. some kids are oversensitive to the smells of food, and seek out bland food as a result. a child who is Sensory Seeking may dislike bland or soft food and only eat food which is very crunchy, textured or highly flavored. a child who has Sensory-Based Motor Disorder may struggle with the coordination skills needed to use a spoon or knife and fork, and may avoid food that takes too much effort to eat. some children with low muscle tone or poor oral motor coordination may struggle to chew and swallow, and may therefore prefer food which does not need to be chewed. There are no tried and trusted methods that will work for every child. But here are some tips and ideas that you can try. This is by no means an exhaustive list, just a few that worked for dealing with my picky eaters! I think one of the most underrated steps in dealing with picky eaters is to try and understand WHY they are picky. If you understand WHY your child is struggling with food, it becomes less personal. I know how easy it is to feel upset when your child rejects your painstakingly prepared meal, but usually the issue is beyond their control, especially when they are young. A child who is "Over-Responsive" to sensations (this usually affects other areas of their life as well, such as dressing, reactions to noisy environments) experiences almost all sensation as threatening. This response is on a subconscious level and cannot be overridden by reason when they are young. Gagging and even vomiting are primitive responses to a taste, smell or tactile (texture) sensation perceived by the brain as dangerous. Likewise, a sensory seeking child feels the need to get stimulation through food that is "intense" (super crunchy, super flavored etc). If this is a new concept for you, and you realize your child may be struggling with SPD in any area, then find a sensory-trained occupational therapist in your area to assess your child. Our ultimate goal is to have kids who eat a healthy balanced diet! We are bombarded by a variety of food choices in our modern age, but our goal is not to have a child who eats everything, but one who is healthy! Make a list of everything they DO eat (a good list to have on hand for caregivers). Assess which nutrients are lacking. Is there a lack of protein and vegetables/fruit? Too much sugar? Too much salt? Can you offer healthier choices to current foods? Can you switch to a healthier brand of peanut butter? A cereal that is just as crunchy but has more fiber? Can you mix the sugary cereal with a brand with less sugar? If peanuts are an acceptable food, can you introduce almonds and other nuts? If raw apple is acceptable, can you introduce a vegetable or fruit with a similar texture (eg raw carrots)? Can you change the way food is presented? If your child is currently being fed by you, try finger foods that she can put into her mouth herself. Alternatively, if your child is doesn't like handling food, or struggles to use utensils, then try using eating aids like these funky spoon holders, or even feeding her new foods yourself. If your child cannot handle soft squishy food right now, then don't force it. Seek help to work on the underlying reasons for the aversion (Sensory Processing Disorder). If your child needs the food to "not touch", then buy some picnic plates with compartments. If your child hates sauces, dish a portion up before you add the sauce to the pot. If your child struggles with fine motor skills or has poor coordination skills, invest in some eating aids to help with mealtimes. At least one meal should be one that your child enjoys - don't make every meal hard for your child and for you. Don't punish your child for being unable to eat something, (but obviously don't accept willful misbehavior like dumping the food on the floor). Keep healthy food on hand - a hungry child may try something new in desperation! Have one day a week when your child can enjoy every meal - for us, Sundays are our "special" food days, where our kids know they won't be asked to eat something new! A key concept in dealing with picky eaters is to introduce one new food at a time, over a period of time, and to not ask your child to eat a plate full of new food! With younger kids (under 4 years), I would just keep offering new foods, but not forcing them to eat it if they say no. Once your child is emotionally mature enough for you to negotiate/reason with them (usually between the ages of 3-5 years), then you can start using incentives and introducing a new food to 'try". This food needs to be tried ("you don't have to like it, you just have to try it") before the rest of the meal can be consumed. Although there are some experts who don't think this is a helpful way for dealing with picky eaters, it is a method which did work for our family. My 5 year old son was happy to eat pasta and chicken breast meat, so I would put that on his picnic-compartmentalized plate along with his fruit, and then give him one small bite of something he had to eat before he could get on with his meal. Sometimes it would be a tiny cube of carrot, sometimes it would be a small piece of pasta with a dollop of sauce. I gave him plenty of milk/water to wash it down, and lots of time to get it down. When it was done, then he could start his regular food. Repeated, regular exposure to little carrot pieces has resulted in his being able to eat 4 or 5 carrot wheels at a meal a few years later! You could use a plateful of "safe" regular food, as the incentive to trying "one bit", as I described above. Or a yogurt/favorite healthy snack as an incentive to finish a whole meal. Try a star chart for every bite of new food that was tried. Introduce new foods in a fun setting, such as a picnic, in a park or in another situation where your child is relaxed and happy. Some children may try a new food when seated on an adult's lap - the security of the hug makes the new food less scary. You can also use food cutters to cut food into interesting shapes to make it more appealing. 6) This, Too, Shall Pass! One of my boys struggled with many areas of Sensory Over-Responsiveness, and feeding was a huge struggle for him. He did not latch until 24 hours after birth, and then refused to take anything but the breast - no dummies or bottles. He gagged and vomited when I introduced baby food, and only started accepting solids at 9 months - finger foods! He still struggles with the texture of food, and although his diet is less varied than that of his peers, it is still healthy and balanced. And every year, he adds a couple new foods to his diet. I have reason to believe that he will be eating a more varied diet by the time he is 21! 7) Pick Your Battles and Count Your Victories! Parenting is not easy, but it is not meant to be a battlefield. As parents, we need to beware of forcing our kids to conform to what "society" expects of them, in order to save our own pride. I know from experience it is socially awkward and sometimes downright embarrassing to have kids who don't eat what other kids eat. I had to learn to swallow my own pride - their struggles are NOT a reflection of my abilities as a mother! It also helped to have a standard explanation of SPD that I could use, and to rejoice in what my kids COULD do well. So what if they are nibbling on bread, while the others are eating sausage and mash? It was more important to me that they were kind and considerate in their playtime with others. Don't make mealtime another battleground that they have to face - for their sanity and yours. And count your victories! Here are our most recent ones! 2013 was the year my younger son learned to eat bananas! There have been many more since then, and I confess each new food accepted received a little celebration! They may be small victories, but they are significant when you are dealing with picky eaters in your family! Share your thoughts on this page with your friends! Please note that you cannot contact OT Mom this way - rather use the contact page on the site! Thanks!